Like the idea of a camping holiday in France but aren’t quite sure if the outdoors life is for you? Why not meet halfway with a glamping experience that will see you enjoying the stunning landscapes of the Alps or France’s sunny west coast without giving up all of your creature comforts. Glamping is the the ideal solution for those who want a little bit more luxury when it comes to camping. 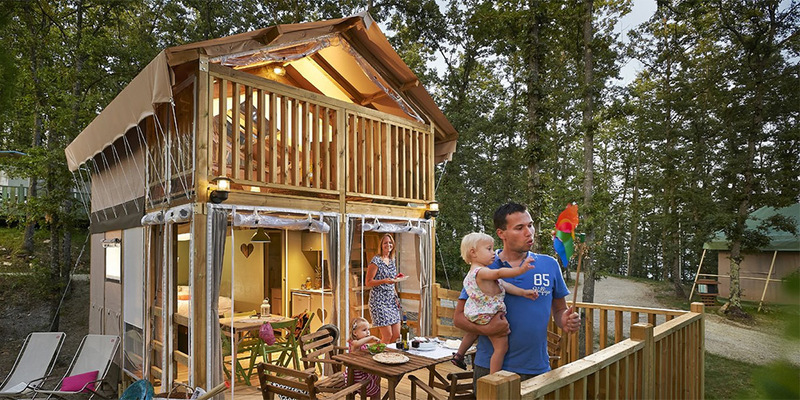 From mobile homes and Airlodges to spacious glamping tents, glamping in France is simple if you book with Canvas Holidays. Our glamping campsites allow you to get back in touch with nature while feeling comfortably at home thanks to features like real beds, kitchenettes, private bathrooms and electricity. It’s not just for couples, either. Glamping can be wonderful for family getaways, especially if you’re travelling with teens unwilling to part with the luxuries of modern life. All of our glamping campsites in France come with fantastic facilities, too, including swimming pool complexes, activities clubs and opportunities to hire bikes, boats and other equipment. They’re also all handily positioned in stunning locations that offer prime access to some of the country’s best beaches, waterparks, cities and towns. You can’t beat waking up every morning to the fresh air and snow-capped peaks of the French Alps. 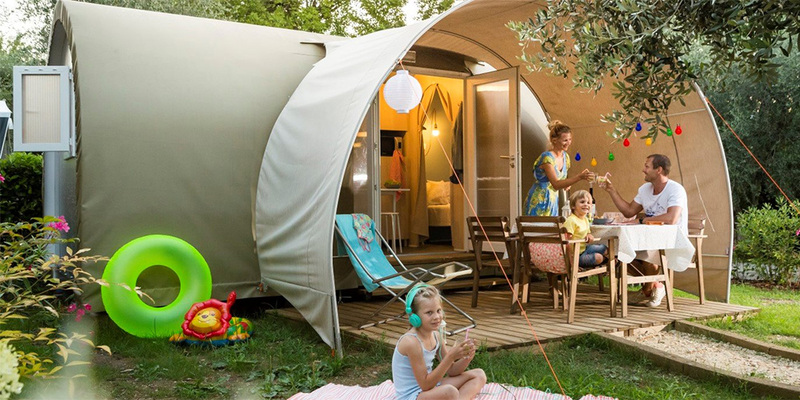 Stay in the region’s beautiful Ardèche valley at Camping Domaine de Chaussy, that offers up glamping opportunities in well-equipped mobile homes for families of all sizes. You’ll also find La Ferme de la Serraz, a delightful and relaxing campsite that’s perched on the beautiful waters of Lake Annecy. When you’re not enjoying your glamping amenities or natural surroundings, take some time out to explore the quaint village of Doussard. There’s something irresistible about a holiday in the south of France — and with Canvas Holidays, you can experience its balmy climate, stylish cities and gorgeous coastline while comfortably glamping. You’ll find Camping Domaine du Colombier in the heart of the French Riviera, just outside the seaside resort town of Fréjus. When you’re not enjoying the amazing pool complex or the nearby golden beaches, take advantage of your air-conditioned and spacious mobile home for some down time. If the rugged Languedoc-Roussillon coastline has more appeal, take a look at Camping Les Méditerranées – Beach Garden, a five-star campsite right on the sand that not only boasts amazing lodge tents but an on-site spa and weekly artisan food market.